Der Meeresspiegel steigt, das ist eine Tatsache. Eine große Überraschung ist dies jedoch nicht, denn der Meeresspiegel steigt nämlich schon seit 15.000 Jahren, seit Ende der letzten Eiszeit. Nun ist dieser Anstieg nicht gleichmäßig über die Zeit verteilt. In warmen Zeiten wie heute oder während der Mittelalterlichen Wärmeperiode steigt der Meeresspiegel schneller, in kalten Zeiten wie der Kleinen Eiszeit verlangsamt sich der Anstieg. In den letzten 23 Jahren, seit Beginn der Satellitenmessungen, stieg der Meeresspiegel mit gut 3 mm pro Jahr an (Abbildung 1). Eine Beschleunigung ist beim besten Willen nicht zu erkennen. Wieder einmal tappt eine Zeitung in die Falle. Hier werden ganz offensichtlich Äpfel mit Birnen verglichen. Während die Meeresspiegelwerte im 20. Jahrhundert zum allergrößten Teil von Küstenpegeln stammen, werden für die letzten zwei Jahrzehnte Satellitenmessungen verwendet. Diese sind jedoch nicht direkt vergleichbar, denn die Satellitenwerte fallen deutlich höher aus, als die noch immer weiter gemessenen Küstenpegelpegel. Es wird vermutet, dass der Korrekturfaktor bei den Satellitenmessungen zu hoch angesetzt ist (siehe auch Beitrag von Klaus-Eckart Puls auf EIKE). Um ganz auf Nummer sicher zu gehen, haben die Autoren und Carling Hay und Eric Morrow zu allem Überfluss auch noch die historischen Messwerte des 20. Jahrhunderts künstlich nach unten gedrückt. Eine hochfragwürdige nachträgliche Datenmassage. Der gleiche Fehler ist im März 2015 auch der TU Darmstadt unterlaufen. Die Kalte-Sonne-Redaktion hat die TU Darmstadt damals um eine Stellungnahme gebeten, die jedoch verweigert wurde. Dies ist unverständlich, wenn man bedenkt, dass die entsprechende Studie mit öffentlichen Geldern gefördert wurde und es die Verantwortlichen jetzt nicht einmal für notwendig halten, auf die Kritik fachlich einzugehen. Die Diskrepanz zwischen Satelliten- und Küstenpegelmessungen wurde kürzlich wieder in einer Arbeit von Jevrejeva und Kollegen offenbar, die im Februar 2014 im Fachblatt Global and Planetary Change erschien. Die Gruppe wertete weltweite Küstenpegel aus und kam auf einen unbeschleunigten Anstieg von lediglich 1,8 mm pro Jahr für die vergangenen 40 Jahre, weit entfernt von den 3,3 mm pro Jahr der Satellitendaten. 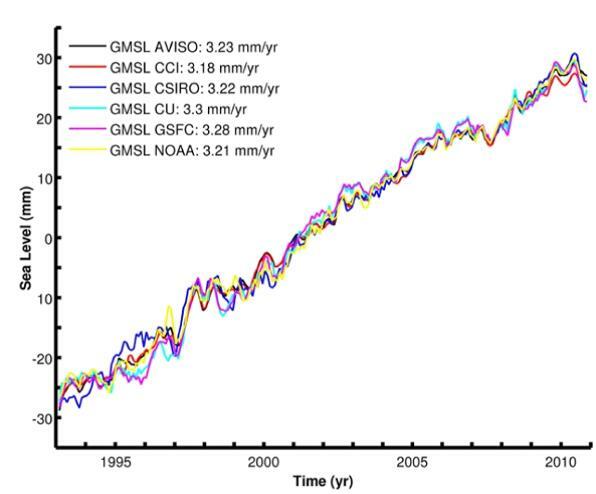 The rate of global mean sea-level (GMSL) rise has been suggested to be lower for the past decade compared with the preceding decade as a result of natural variability1, with an average rate of rise since 1993 of +3.2 ± 0.4 mm yr−1 (refs 2, 3). However, satellite-based GMSL estimates do not include an allowance for potential instrumental drifts (bias drift4, 5). Here, we report improved bias drift estimates for individual altimeter missions from a refined estimation approach that incorporates new Global Positioning System (GPS) estimates of vertical land movement (VLM). In contrast to previous results (for example, refs 6, 7), we identify significant non-zero systematic drifts that are satellite-specific, most notably affecting the first 6 years of the GMSL record. Applying the bias drift corrections has two implications. First, the GMSL rate (1993 to mid-2014) is systematically reduced to between +2.6 ± 0.4 mm yr−1 and +2.9 ± 0.4 mm yr−1, depending on the choice of VLM applied. These rates are in closer agreement with the rate derived from the sum of the observed contributions2, GMSL estimated from a comprehensive network of tide gauges with GPS-based VLM applied (updated from ref. 8) and reprocessed ERS-2/Envisat altimetry9. Second, in contrast to the previously reported slowing in the rate during the past two decades1, our corrected GMSL data set indicates an acceleration in sea-level rise (independent of the VLM used), which is of opposite sign to previous estimates and comparable to the accelerated loss of ice from Greenland and to recent projections2, 10, and larger than the twentieth-century acceleration2, 8, 10. Wie würden Sie es finden, wenn ein Fußballspiel nach Ende der regulären Spielzeit 3:3 ausgeht, das Ergebnis aber nachträglich auf 3:1 „korrigiert“ wird. Gründe finden sich immer. Present-day sea-level rise is a major indicator of climate change1. 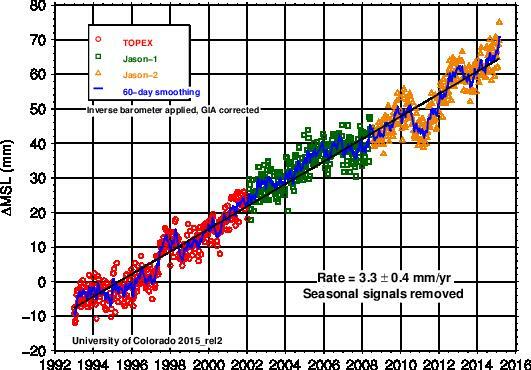 Since the early 1990s, sea level rose at a mean rate of ~3.1 mm yr−1 (refs 2, 3). However, over the last decade a slowdown of this rate, of about 30%, has been recorded4, 5, 6, 7, 8. It coincides with a plateau in Earth’s mean surface temperature evolution, known as the recent pause in warming1, 9, 10, 11, 12. Here we present an analysis based on sea-level data from the altimetry record of the past ~20 years that separates interannual natural variability in sea level from the longer-term change probably related to anthropogenic global warming. The most prominent signature in the global mean sea level interannual variability is caused by El Niño–Southern Oscillation, through its impact on the global water cycle13, 14, 15, 16. We find that when correcting for interannual variability, the past decade’s slowdown of the global mean sea level disappears, leading to a similar rate of sea-level rise (of 3.3 ± 0.4 mm yr−1) during the first and second decade of the altimetry era. Our results confirm the need for quantifying and further removing from the climate records the short-term natural climate variability if one wants to extract the global warming signal10. Sea level variations prior to the launch of satellite altimeters are estimated by analyzing historic tide gauge records. Recently, a number of groups have reconstructed sea level by applying EOF techniques to fill missing observations. We complement this study with alternative methods. In a first step gaps in 178 records of sea level change are filled using the pattern recognition capabilities of artificial neural networks. Afterward satellite altimetry is used to extrapolate local sea level change to global fields. Patterns of sea level change are compared to prior studies. Global mean sea level change since 1900 is found to be 1.77 +/-0.38 mm/yr on average. Local trends are essentially positive with the highest values found in the western tropical Pacific and in the Indian Ocean east of Madagascar where it reaches about +6mm/yr. Regions with negative trends are spotty with a minimum value of about -2 mm/yr south of the Aleutian Islands. Although the acceleration found for the global mean, +0.0042 +/- 0.0092 mm/yr, is not significant, local values range from -0.1 mm yr-2 in the central Indian Ocean to +0.1 mm yr-2 in the western tropical Pacific and east of Japan. These extrema are associated with patterns of sea level change that differ significantly from the first half of the analyzed period (i.e., 1900–1950) to the second half (1950–2000). We take this as an indication of long period oceanic processes that are superimposed to the general sea level rise. Leider “versäumte” es das Alfred-Wegener Institut, über die neue Studie eine Pressemitteilung herauszugeben. War das Ergebnis vielleicht nicht dramatisch genug? Nur wenige Wochen später, im Januar 2015 erschien eine Studie eines 20-köpfigen Forscherteams um Michael Ablain im Fachblatt Ocean Science. Die Wissenschaftler glichen alle vorhandenen Satellitendaten und Bearbeitungen ab und kamen ebenfalls zu einem eindeutigen Ergebnis: Eine Beschleunigung des Meeresspiegelanstiegs ist weit und breit nicht in Sicht (Abbildung 2). Beteiligt waren unter anderem Forscher des GFZ Potsdam und der Universität Hamburg. Auch hier unterblieben Pressemitteilungen. Abbildung 2: Meeresspiegelentwicklung laut Satellitendaten verschiedener Arbeitsgruppen. Quelle: Ablain et al. 2015. Ganz offensichtlich eignen sich die Satellitendaten der vergangen gut zwei Jahrzehnte gar nicht, um belastbare Aussagen zu Beschleunigungen oder Verlangsamungen zu machen. A data set of precise radar altimeter sea surface heights obtained from the same 10 day repeat ground track has been analyzed to determine the magnitude of change in the ocean “mesoscale” variability over two decades. Trends in the standard deviation of sea surface height variability each year are found to be small (typically ∼0.5 percent/yr) throughout the global ocean. Trends in positive and negative extreme sea level in each region are in general found to be similar to those of mean sea level, with some small regional exceptions. Generalized Extreme Value Distribution (GEVD) analysis also demonstrates that spatial variations in the statistics of extreme positive sea levels are determined largely by the corresponding spatial variations in mean sea level changes, and are related to regional modes of the climate system such as the El Niño-Southern Oscillation. Trends in the standard deviation of along-track sea level gradient variability are found to be close to zero on a global basis, with regional exceptions. Altogether our findings suggest an ocean mesoscale variability that displays little change when considered over an extended period of two decades, but that is superimposed on a spatially and temporally varying signal of mean sea level change.